The much-anticipated feature "biometric authentication" on WhatsApp is now available! iOS users have started receiving an important Whatsapp update with the release of their latest build version 2.19.20. The new update now allows users to lock their WhatsApp application natively by using the Face ID or the Touch ID. The new authentication feature has been in the course since October last year when the Face ID and Touch ID feature were added to the beta version of the social messaging application for the first time. 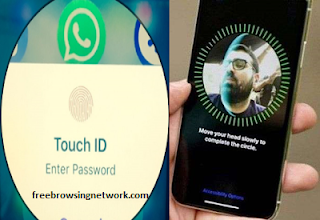 Once you have enabled the Face ID or Touch ID feature, the app will be completely protected, so the user will need to authenticate his/her identity in order to open WhatsApp (from the app icon, from the notification or from external pickers). It will protect the entire app, it means the feature doesn't add the additional security to your individual WhatsApp conversations. How do I thrill to the New Feature?? Firstly, update your Whatsapp to the latest version. 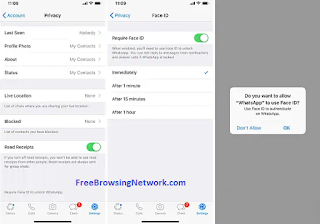 Lock the WhatsApp app with Face ID or Touch ID by going to Settings > Account > Privacy > Screen Lock. Once you moved to the Screen Lock, the app shows the available authentication method - either Face ID or Touch ID - that you can enable to lock your WhatsApp. Enabling this means that privacy-conscious users can add an extra layer of security to the WhatsApp conversations – even if their device is unlocked. WhatsApp for Android is also in the rumors to bring a similar form of authentication layer in the coming future. Comment on "WhatsApp Launches Biometric Authentication for iOS (iPhone) Devices"